Police are calling a seven-year-old boy a hero after he managed to hold onto his classmate who slipped off a ski lift at an Ontario ski resort long enough for resort staff to set up a safety net below. Durham police say the seven-year-old skier is in stable condition at Toronto's Hospital for Sick Children after sustaining serious injuries in the fall. 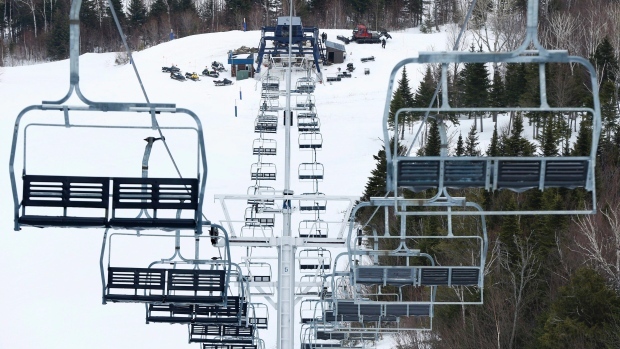 The boy was heading up a hill on the ski lift at Lakeridge Ski Resort in Uxbridge, Ont., located about 65 kilometres northeast of Toronto, on Thursday with three other classmates when he lost a ski. Police said the boy turned in his seat to look back when he slipped off the seat and began to fall. A classmate sitting beside the boy managed to grab him and hold onto him for about two minutes as he was dangling about 40-feet off the ground. Meanwhile, staff at the resort had enough time to set up a safety net below. The boy fell into the net and then bounced onto the hill. "For a seven year old to have that type of maturity and willpower, that is something that goes beyond the expectation for any kid -- it's basically heroic," Durham Regional Police Sgt. Bill Calder told The Canadian Press. The boy was airlifted to Sick Kids hospital and he's expected to make a full recovery. The classmate who held onto the boy and staff from the ski resort are being recommended for a citizen recognition award.